With Golden Jump Start for quicker, longer growth, Impact seed treatment to double your seedling survivability, and RainBond water absorbing polymers hold up to 200x their weight in water. Holds water that may be lost to percolation through the soil or evaporation. The New Improved No Plow builds organic matter and improves soil, Increase topsoil fertility, helps alleviate soil compaction, and suppresses weed growth. If you have out-of-the-way or hard-to-get-to locations you have always wanted to plant; or you simply don’t have access to a tractor or cultivating equipment, the new IMPERIAL "NO-PLOW" WILDLIFE SEED BLEND is the perfect product for you. NO-PLOW is also excellent in drier climates where summer rainfall can not be counted on. The Whitetail Institute released No-Plow in response to hundreds of requests and inquiries from wildlife enthusiasts for a quality seed formulation that can be planted without the use of equipment or cultivation. What exactly does ‘NO PLOW" mean? Just what it says. It is sown without plowing, just as seed is in nature – on the surface, with minimal or no soil preparation or tillage. To ensure the quickest growth and coverage, the new formula includes the now-famous "GOLDEN JUMP START" ingredient to guarantee fast initial growth and get deer to your food plots as quickly as possible. 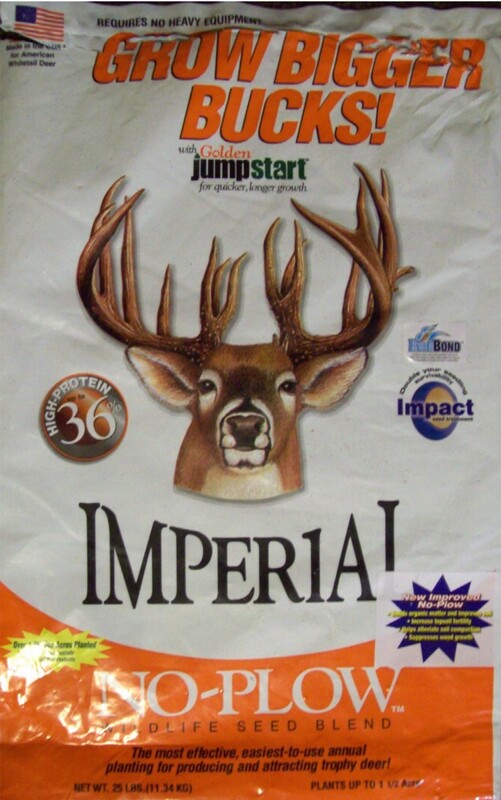 IMPERIAL "NO-PLOW" is the easiest, no-fuss, no-bother way to provide your deer herd with additional protein during the antler-growing months on hard-to-reach places. It is also the easiest way to attract and hold deer on your food plots. When planted in the Fall, NO-PLOW can last until mid Summer. When planted in the Spring, NO-PLOW will thrive until late Summer. Contains; Gulf annual ryegrass, dwarf essex rapeseed, alex berseem clover, yucchi arrowleaf clover, Dixie crimson clover, trophy rapeseed and eco-till radish. Plant at approximately 18 - 25 lbs per acre. NOTE: This 1 lb will not be in the original Whitetail Institute Bag, the seed is purchased in bulk and re-weighed to order.